Here is a draft of my map of some the most infamous U.S. serial killers. Mainly using newspaper clips from each assault, I’ve been able to track where each killer was and when. The few difficulties that I have run into, however, include having trouble finding images for a few of the victims, as well as having differing amounts of information on each crimes. However, I think this map does a good job of demonstrating the flaws of geographic profiling. Place the page on a wordpress site. This would both support the map, as well as provide some definitions and analysis of geographic profiling. 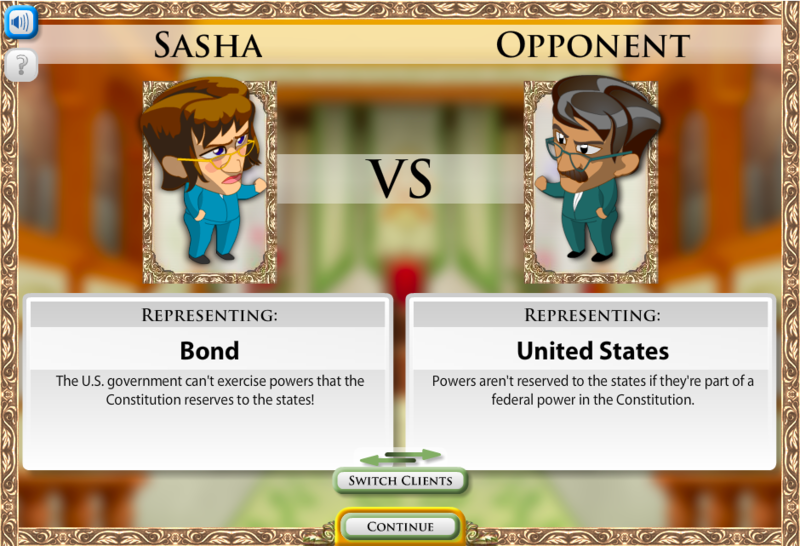 Icivics is a platform that creates and hosts civics-oriented games to promote student interest in history and government. Some of the current games highlighted on the website are related to law, the founding fathers, journalism and immigration. The platform strives to be nonpartisan, in order to foster conversations around current events in the classroom. 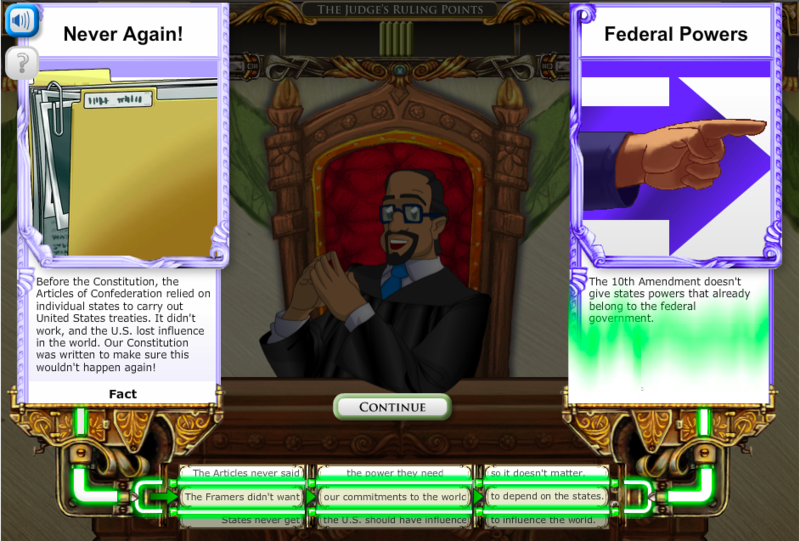 In Argument Wars, the user plays as a lawyer in front of the Supreme Court. As such, you choose your position in cases, including Bond v. United States, Brown v. Board of Education, Hazelwood v. Kuhlmeier and Miranda v. Arizona, and make arguments that support your stance. Once you choose your character and position, you decide which amendment the case relates to. In this example, I’ll be arguing the United States’ side of Bond v. United States, an issue of states’ rights relating to the Tenth Amendment. 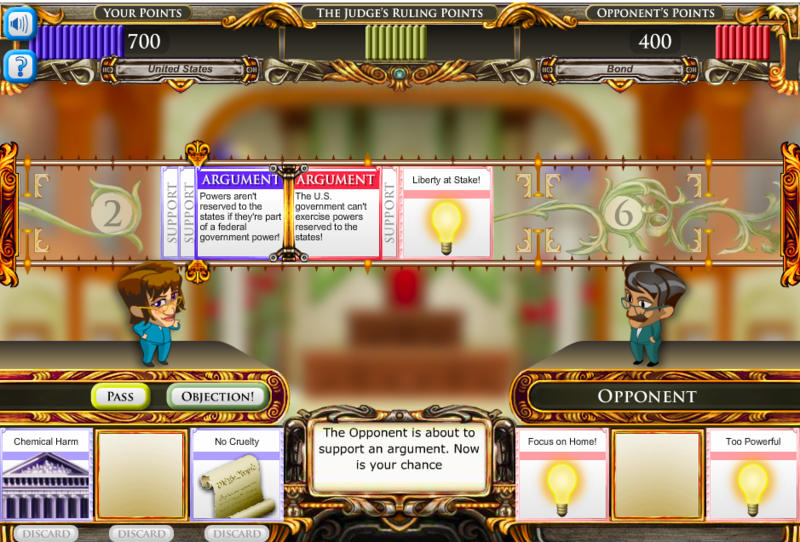 Throughout the game, each player makes arguments support their position. Each player has certain cards, which either support an argument, or may be unrelated at all. You can click on each card to read more about what the argument would entail and dismiss cards that are unrelated or would support the other side instead. Once you choose the proper card, the judge rules on whether the argument is valid. If the judge wants to hear more, you match tiles to connect the supporting evidence or arguments with the point at hand. You are given three rounds to do so. Additionally, whenever the opposing player makes their argument, you can choose to object. However, be careful when objecting! An incorrect objection can result in a reduction of points. The final results of the case depends on how many points you earn throughout the game. Points are given for correct arguments and support of those arguments. Overall, Argument Wars, and the icivics platform in general, seems like a great way to teach students about civics and how the legal system works. Although it does little to teach about the structure of the court system, each round of the game presents the main concepts of a Supreme Court case. Additionally, by arguing in favor of one side, users are taught critical thinking skills, as well as why the case was controversial or important at the time that it was argued. 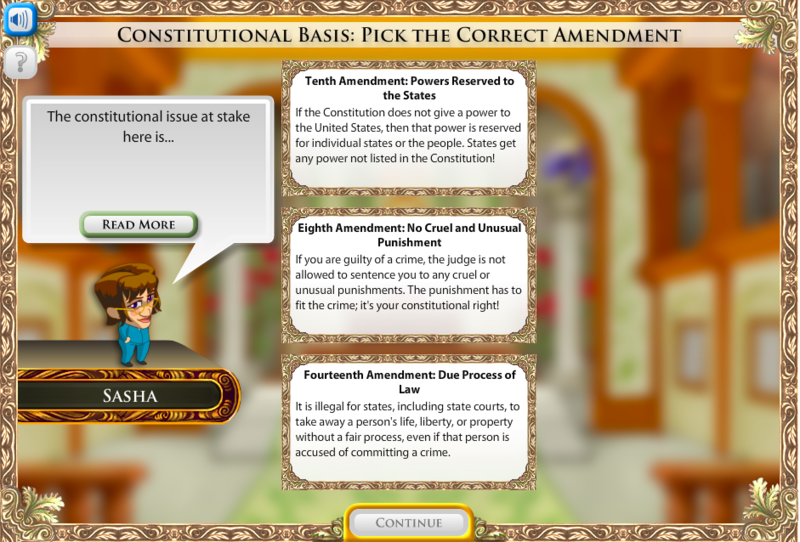 By being a game, students are provided with an interactive way to learn about cases, which otherwise is usually done by writing a case brief. Furthermore, the game cannot be easily won. The player must read through what the judge and opposing side says in order to choose their argument. I think that this is especially important in games for students. I remember playing math games in elementary school that were fun, but failed to connect the curriculum to the activity. In addition to the games, icivics has a section on their website that lays out lesson plans for teachers based around the games. The platform, which provides evidence and methodology on research about the games’ impact on students, seems to be both engaging and thoughtful. In the transcript, Espenschied discusses the differences between performance and activity, with performance being the thing that the computer does, and the activity being what the user does. However, somewhere between the two, Espenschied highlights that there can often be a disconnect. In demonstrating this, the author uses a visualization of a globe that shows users popular search terms from a certain location at a certain date (At least I think that’s what it does? There site is now down). The visualization is comparable to automated search terms or Google Maps. However, when users try to make sense of the information, such as by determining why a term was popular at a certain point in time, they are relying on pure assumption, which can lead to inaccuracies. However, it’s important to acknowledge that the internet is constantly evolving. The way that websites look, for example, are extremely different than what they looked like 10 years ago. As such, digital collections can be reorganized in order to provide users with more information. Espenschied gives the example of Artbase, which originally was a crowdsourced website where users could post their own art. Now, it is heavily curated, with introductions and categories, which provide users with more information and room for new interpretations. I assume, that this also means that someone had to go back to earlier posts and categorize them. However, an interesting point that the author brings up is whether updating or republishing artifacts that are native to the internet is a threat to the authenticity of the artifacts. For example, if an artist makes a graphic for Windows 5, is it right for curators or archivists to republish the graphic for Windows 10, even if Windows 5 no longer works for the art? 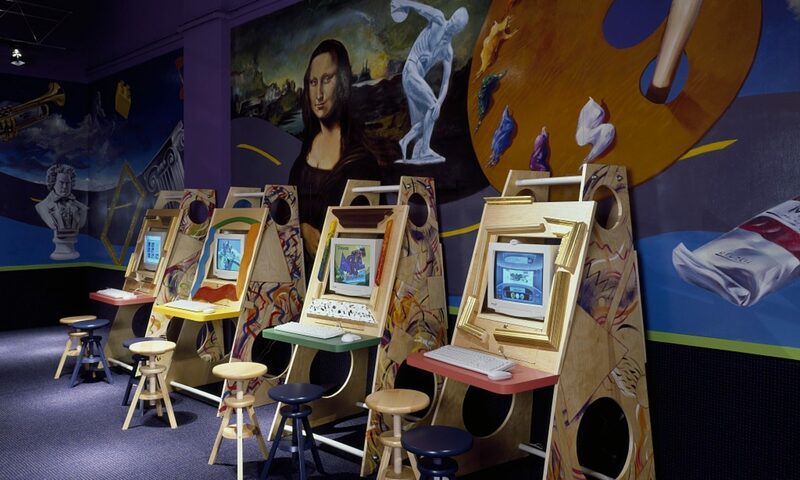 Is it the responsibility of curators to find a Windows 5 computer to display the art properly? What if the artist does not have a say in the matter, but not doing so would risk the preservation of the graphic? What about historians or researchers republishing the artifact online for a new interpretation? Is that a threat to the artifact’s authenticity? Lastly, Espenschied emphasizes the importance of context in preservation. You can’t simply say “follow this link for more information,” because what if that link stops working? Something that I think is always important to consider is that you can never expect users to click on that link in the first place. 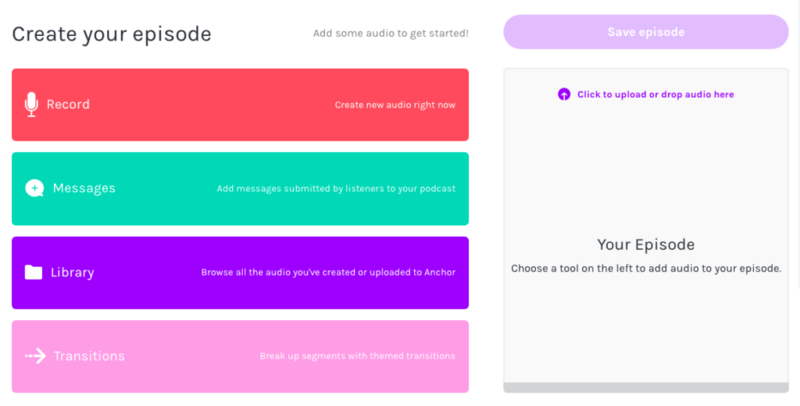 Anchor is a website and app that allows users to create, host and distribute podcasts. Unlike most apps of its type, Anchor offers unlimited free hosting, distribution to major platforms, such as Spotify and Apple Podcasts, and monetization. I personally use Anchor for The Eagle’s podcast “Beyond the Byline.” I’ll use our account to demo this, since we already have episodes uploaded (and it’s a chance to shamelessly self-promote). The challenge that many face when making a podcast is the editing process. Although there are free and fairly straightforward apps that make editing easier (see the post on Audacity), it’s easy to feel overwhelmed. To start recording and editing, go to the “New Episode” button in the top right corner of your account. Here you’ll find four buttons: record, messages, library and transitions. 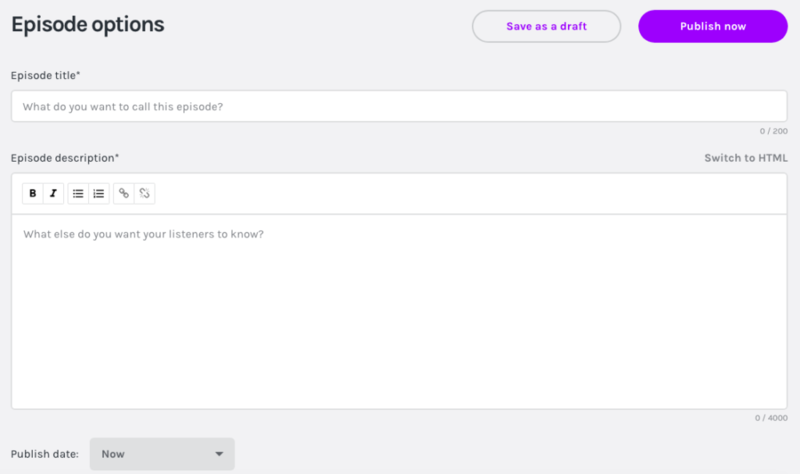 By navigating these options, you can start putting together the recordings, sound effects and transitions that will eventually make up your episode. For those who edit with another software, you can upload an already edited audio file by dragging the file into the “Your Episode” space. Once you’ve put the finishing touches on your episode, you’re ready to upload! Click “Save Changes,” add a title, description and choose when you’d like to publish (now, or at a later date and time). The great thing about Anchor is that your podcast does not only have to live on Anchor. Most podcast-listeners have a go-to platform, where they listen to podcasts. For many, this is Spotify or Apple, but there are also plenty of podcast-specific platforms, such as Podbean, Google Podcasts and Pocket Casts. 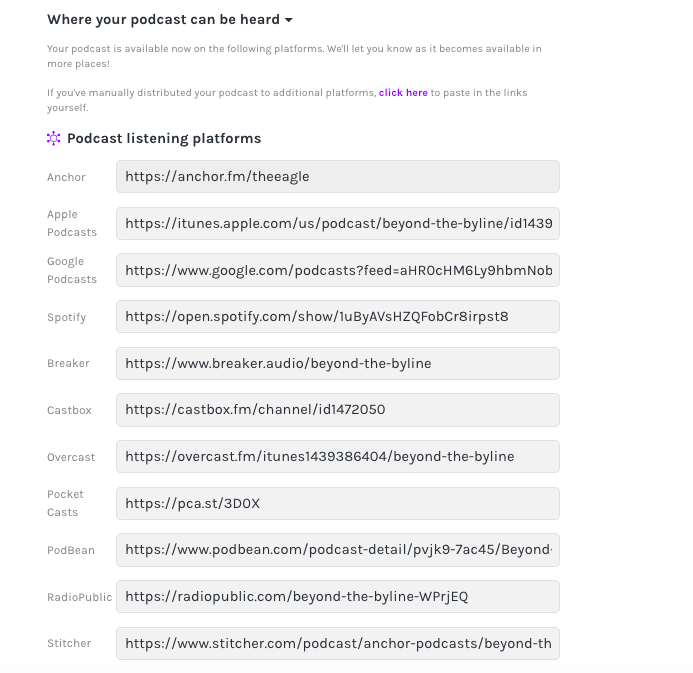 To get your podcast on more platforms, go to your settings and scroll down to “Where your podcast can be heard.” Once you’ve chosen to distribute your podcast, Anchor will do all the work of connecting your episodes with other platforms. Usually the first distribution takes a couple of days, since your account must be verified and approved. However, once you’ve chosen to distribute, and you’ve gone through the process once, every time you post a new episode to Anchor, your episode will be posted on all platforms without you having to manually post. To start monetizing go to the “Money” section in your settings, the same way you did for distribution. Here, you can enter a message to encourage listeners to donate to your work. Anchor will also connect you with potential sponsorships. These are companies that would advertise during your episode. You can decide who can advertise in your episodes, where in the episode you’d like to place the ad and which episode will have ads. You can also record the ads yourself to make them more interesting to your listeners. Once you start monetizing, go to the “Money” tab at the top of the website. This is where your wallet lives. It shows how much money you’ve made from your podcasts and allows you to cash out whenever you’d like. When you’ve accumulated a few episodes and have given your audience some time to actually listen, you can check out your analytics. Analytics are the first thing that come up on your dashboard when you open Anchor. Analytics give you a few ways to looks at how your podcast is doing, what’s working for your audience and what’s not. 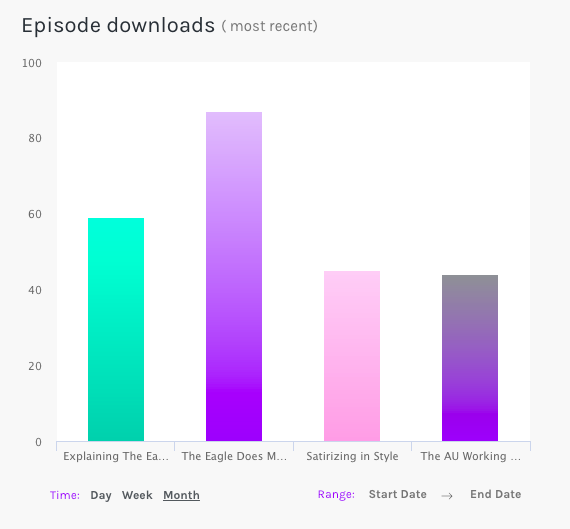 On the page you can see the total plays, plays per episode, plays over time, comparisons of downloads per episode and on what platforms your audience is listening to your podcast. In “Conversations with a Killer: The Ted Bundy Tapes,” Netflix follows the footsteps of serial killer Ted Bundy, both before and after his crimes. At one point in the series, Bundy’s murders are shown on a map, demonstrating Bundy’s movements across the country. In addition, the victims’ names, faces and locations are shown in chronological order, alongside those who Bundy confessed to killing, but whose names are unknown. Geographic profiling is a forensic technique that examines the locations of a series of crimes to determine the location of the criminal. The technique relies on the idea that a criminal will commit crimes outside of the neighborhoods that they live in, but close enough to allow for a quick escape. The theory also states that murderers must know the area to be able to successfully commit their crimes. Bundy’s murders demonstrate the exact opposite to this theory, which is a basis for a common method of investigation. This project would examine the paths of several prominent serial killers in order to explore whether geographic profiling is an accurate method of investigation. Furthermore, it would provide a look into the psych of serial killers. Questions to ask are: Do murderers feel comfortable committing crimes in the area that they live? Is having a home base necessary to commit a crime? Does escaping from an area or state allow murderers to evade conviction? In the case of Ted Bundy, travelling from state to state prevented investigators from tying crimes to him, in part due to police officers’ lack of communication. Although he faced charges in Colorado, during his escape from prison, he committed three more murders in Florida. Even then, Florida officers did not think of Bundy as a suspect until the time he was found. Audience: For this project, the audience would be forensic scientists, psychologists and historians. Existing Projects: Texas State University has a similar project examining crimes committed to Jack the Ripper. On their site, researchers provide a map of the murders. Unlike this project, I hope that mine will follow several killers on an interactive site. Plan for Outreach and Publicity: This project could be shared by researchers and forensic scientists in the field. Additionally, social media, such as Twitter, could be used the share the final project, especially due to public interest in serial killers. Evaluation Plan: Success of this project would be based on how possible it is to find and spread information. Finding the specific location of murders, as well as whether they are confirmed to be tied to a certain killer may be difficult. Furthermore, the project may overlook crimes that may have been committed by an individual, but never successfully attributed to them. However, once this information is found and presented as best as possible, success would be measured by the number of clicks and amount of time individuals spend interacting with the map.